Welcome to one of our online homes! We are Joanna and Ron and write together as The Lazuli Portals. We write novels, short stories, flash fiction, and poetry. 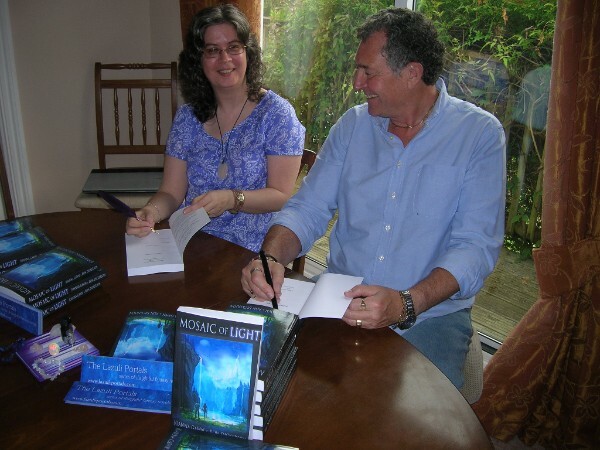 The core themes throughout our novels are: spiritual awakening, natural magic (energy healing), synchronicities, crystals, friendship, developing intuition, and the incredible power of universal energy. Our blog follows our journey as we write and publish our novels and short stories (and learn about self-publishing, marketing, and ourselves along the way!) We also share books that we’ve enjoyed or which have inspired us. In addition, we have a Lazuli Portals Newsletter. There’s a handy ‘Subscribe’ link at the side of this page. It doesn’t cost anything to join. … we now offer a ‘Bonus Section’ for those of you interested in subtle energies, Reiki, Orbs of Life (on which the lovelight orbs in our books are based) and affirmations. These are all free, even the Quartz Crystal Reiki attunements! Please follow this link to find out more. Oh, hooray! Yes, it was a good decision, it just took a fair bit of work to get to this point. Glad you like it! So do we lol. Loving your new look – brilliant!!! Thank so much, Callie! Yippee!!!! Looking fabulous and very professional! Will raise a glass to you this evening in celebration – love wordpress! Thank you for following our blog (cmeblogspot.com) 🙂 We look forward to staying connected and reading future posts!